White Oaks are among our most beautiful native Oaks, starting out as upright young trees and maturing to magnificent specimens as broad as they are tall. 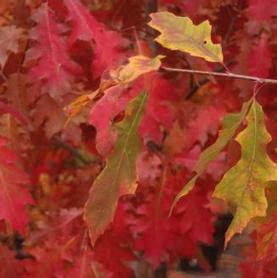 Quercus alba retains its foliage late in the fall, changing from summer greens to shades of bronze red and brown. Young Oaks often carry their attractive tan leaves well into the winter. The acorns produced by mature White Oaks are a very important food source for many varieties of birds and mammals. Slow growing but well worth the investment. The Swamp White Oak is one of our most beautiful native trees, growing to a magnificent broad tree that tolerates both wet and dry situations. When young, the bark is attractively mottled with scales of tan, gray and brown. The fall color is shades of yellow and orange, changing to a soft russet-tan in winter. 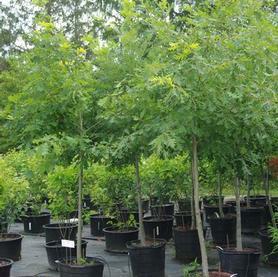 Juvenile trees retain their winter foliage and are often confused with White Oaks, since the leaves are very similar. Acorns provide an important source of winter wildlife food (wild Turkeys in particular love them). 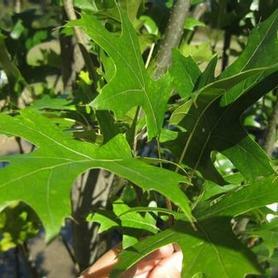 PRN Preferred: This is the most versitile Oak we know of for variable sites, and it is one of our favorite native trees. Green Pillar® ('Pringreen') is one of the most fastigiate forms of Pin Oak we have seen, found by our nurseryman cousin Alan Jones, while he was at Princeton Nurseries. The branches are tight and upward pointing, giving it a striking appearance in all seasons. Fall color is a lovely reddish maroon and it is a very adaptable tree for a wide range of sites. Green Pillar® is tolerant of wet, dry, and tight sites. 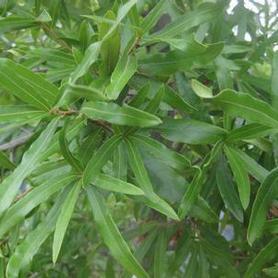 Willow Oak is a lovely versatile native Oak which grows well in both country and city conditions. The habit is a broad oval, without the descending branch habit of Pin Oaks, so Quercus phellos makes a very attractive street tree. The Willow shaped leaves are much easier to deal with than those of other members of the Red Oak family because of their small size. The foliage turns an attractive dull gold in fall and is often retained for much of the winter as tan rustling leaves. The small acorns are an important food source for many birds and mammals. Our state tree in New Jersey and one of the loveliest natives in the forest. 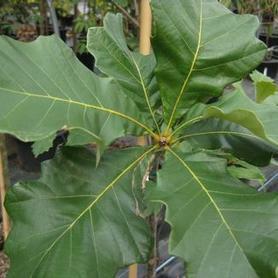 Northern Red Oak is adaptable and fast-growing. Its foliage is a lustrous dark green in summer, turning to a deep red in fall. Salt tolerant, so it works in urban settings well. 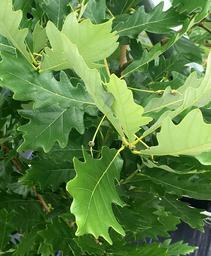 Fall transplanting is not a problem with an Oak grown in a container. Kindred Spirit® ('Nadler') Hybrid Oak is an interspecific hybrid of the Columnar English Oak (Q. robur fastigiata) and Swamp Oak (Q. bicolor). The habit is tightly columnar, and the foliage is clean and mildew resistant. The leaves are dark green with a silver underside, turning shades of yellow and bronze in fall. Quercus x Kindred Spirit® would make an excellent tall hedge, or be an attractive architectural element when used as a specimen. Although a cross between two different species, Kindred Spirit® does produce acorns which provide food for wildlife. This is another winner from Earl Cully of Heritage Trees.